To make the pie crust: In a large bowl, mix together the flour, sugar, and salt. Using a box grater, grate the cold butter atop the flour mixture. Working quickly and using your hands, break the butter bits into the flour until evenly distributed and the size of small peas. Add 1/2 cup of the water and mix. Using your hands, dig in the bowl and knead the dough 3 to 5 times you’ll notice it will begin to come together. If the mixture is still, add a tablespoon of water at a time until it comes together. Flour your counter or work surface and dump the dough onto it. Knead the dough a few more times and form it into a ball. Cut the ball in half, and form each half into a 1”-thick disk. Wrap each disk with plastic wrap, and transfer to the refrigerator to chill for at least 1 1/2 hours, or ideally overnight. When the dough is done resting, remove the first disk from the fridge and allow it to shake off its chill for 10 minutes (this will make it easier to roll out). Liberally flour your work surface and rolling pin. Begin to roll out the dough to 1 1/2” round that’s about 1/8” thick, being sure to rotate it every so often to avoid sticking. Wrap the dough around the rolling pin and unroll it over a 9” pie dish. Gently fit the dough onto the bottom and up the sides of the pie dish and trim, leaving a 1” overhang. Transfer the piecrust to the freezer to chill for 30 minutes while you make the filling. To make the filling: In a large bowl, combine the peaches, sugars, tapioca flour, bourbon, and salt. Mix until the peaches are completely coated. To assemble the pie: Remove the pie crust from the freezer and pour in the filling. take the second disk of pie dough from the fridge, allow it to sit at room temperature for 10 minutes, and roll it out to another 13” round that’s about 1/8” thick. At this time you have some options. You can cut the dough into strips for a lattice top, cut out small circles using a piping tip for a polka-dot effect, or simply lay the dough on top of the pie and make slits on the top. Whatever top you choose, be sure to seal the top crust to the bottom by trimming the overhang and crimping the top and bottom crusts together. Be sure to cut a vent to let out the steam. Transfer the entire assembled pie to the freezer and chill for 15 minutes. Meanwhile, preheat the oven to 425 F.
Brush the crust with the beaten egg and sprinkle with the turbinado sugar. Place the pie on a baking sheet and bake for 25 minutes. Turn the heat down to 350 F and bake for an additional 30 minutes, or until the filling is bubbling and the crust is golden brown. If at any time the edges of the piecrust turn a bit too dark, tent the edges with a sheet of foil. 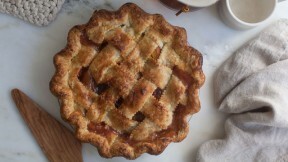 Allow the pie to cool completely before slicing 3 to 4 hours.